The relatively new Biomedical STEM classes, Principles of Biomedical Sciences (PB), Human Body Systems (HBS) and Medical Interventions (MI) are teaching Ridgefield High School students valuable information that is genuinely applicable to real life. Not only do students learn about medical science but they also develop professional skills they can take with them into the workplace. Principles of Biomedical Sciences (PBS) is the first class of three in a series offered in the Biomedical STEM program. In this class, students are presented with a mysterious death scenario and are taught to use the scientific method to slowly work towards solving the cause of death. With the universal knowledge learned in this class, they advance to learning more complex concepts and labs. 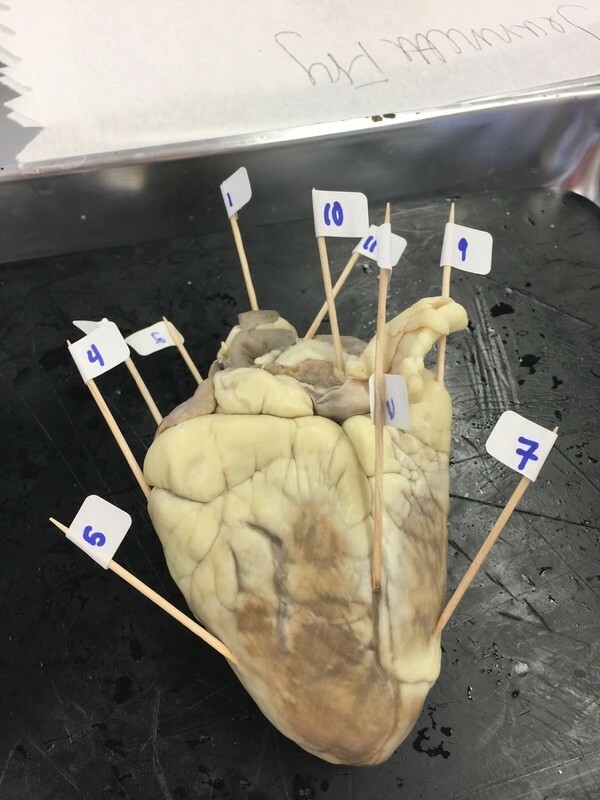 Students in this class use a real-life sheep heart to learn the anatomy of a heart. 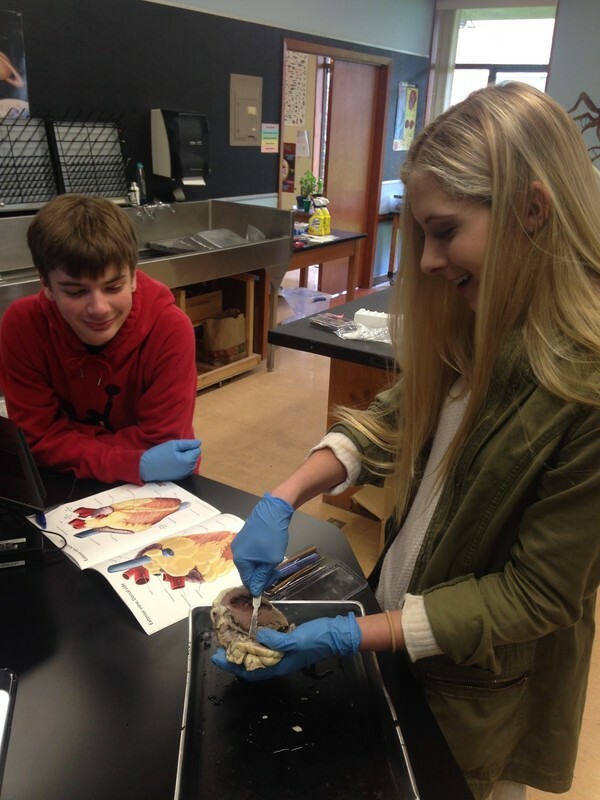 Ryker Resio and Olivia Zimmerly dissect a heart in PBS class. Students learn the anatomy of a human heart using a real-life sheep heart. 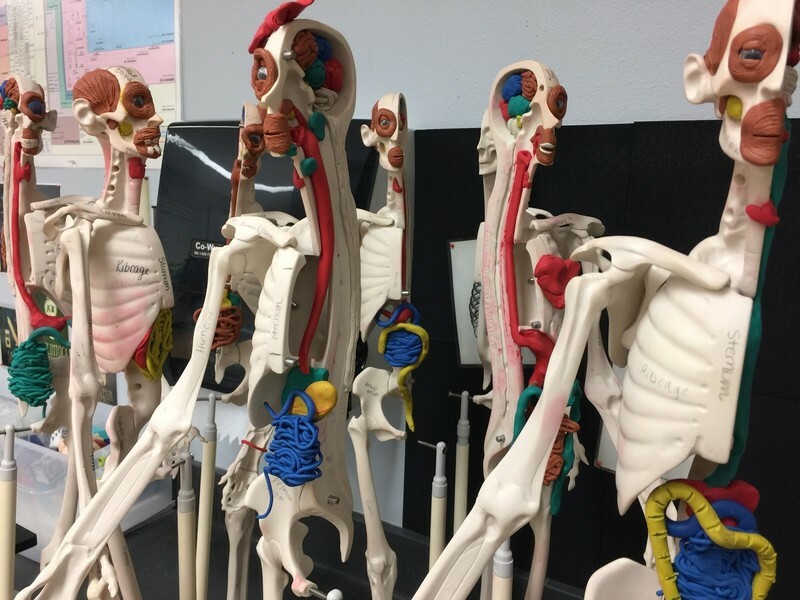 In Human Body Systems (HBS), students learn about anatomy through interactive and personal labs and apply this knowledge to hands-on model building. As an example, students in this class build a model of the human digestive system, which helps them learn human anatomy in different ways. With this knowledge, they are able to explore careers directly related to certain areas of study. It gives them a chance to apply this information to real life. “Students are engaged in lab activities because the experience is personal, and they are often gathering data about themselves,” said Shannon Hemrich, Human Body Systems Instructor. Anatomical models built by students in HBS class. Medical Intervention (MI) is the third year in the Biomedical Science series of classes. It focuses more on the real-life medical application of the skills that students acquired in the previous classes. In this class, students are given a scenario in which a hypothetical family exhibits various symptoms. Their assignment is to determine a diagnosis and treatment that best fits the situation. The class also provides an opportunity for students to look at a real screening test for different types of cancers. Students learn about the genetic and environment factors that could be the contributing causes of cancer. All of the STEM classes in this series provide students with information they can use to explore the various career pathways available in the biomedical health sciences -- useful knowledge for students interested in pursuing a career in the medical field.